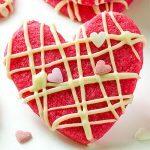 VALENTINES RED VELVET SANDWICH SUGAR COOKIES – Two red velvet sugar cookies are sandwich with cream cheese filling and topped with cute Valentines sprinkles! Easy and adorable Valentine’s Day treat! These Red Velvet Sandwich Sugar Cookies are perfect for Valentine’s Day, filled with cream cheese and decorated with sprinkles. 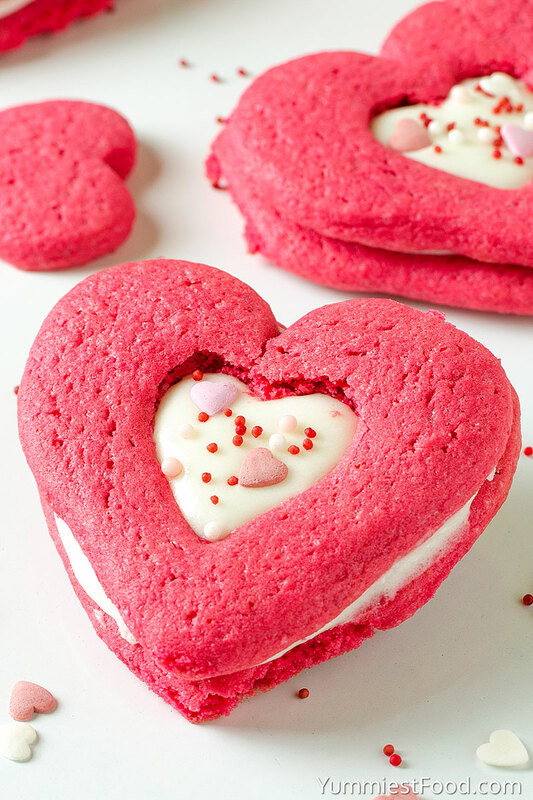 These easy heart-shaped red velvet sandwich cookies make a great Valentine’s Day gift. These decorated red velvet sugar cookies are a fun treat for kids and adults. These festive little treats are so easy to make and fun project to do with your kids. 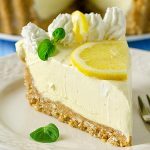 You can make them very easy and they are very delicious and effective for this special day. 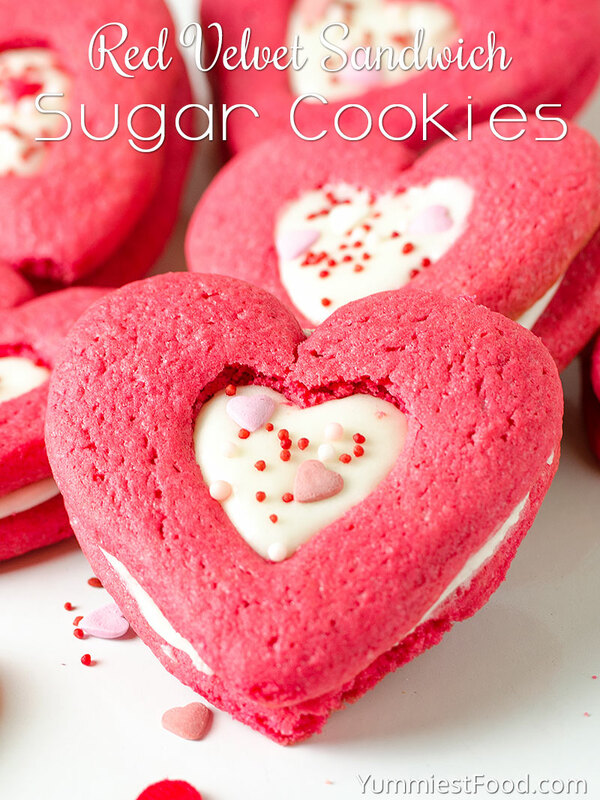 These Valentines Red Velvet Sandwich Sugar Cookies are the perfect way to show someone you love them. It’s a tradition in my house to make heart shaped cut sugar cookies and these Red Velvet Sandwich Sugar Cookies are simply the best. We shared a similar recipe with you for Christmas and honestly, it’s too good to not share again. 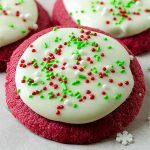 How to make perfect red velvet sugar cookies? So when I tell you that this recipe makes the best, most perfect red velvet sugar cookies, you can truly believe me. 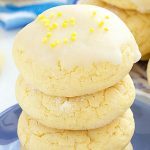 Because if I can make perfect red velvet sugar cookies with this recipe, I promise, you can make perfect cookies too! You don’t need any special tools and you definitely don’t need to chill the dough. In a large bowl mix together all-purpose flour, baking powder and salt, set aside. 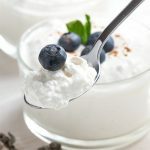 In a medium bowl mix together butter and sugar until smooth, at least 2 minutes and then add egg, vanilla extract and red food coloring and beat. Slowly add in the flour mixture a little bit at a time until the dough is fully combined (if dough becomes too stiff for your mixer turn out the dough onto a countertop surface, wet your hands and finish off kneading the dough by hand). 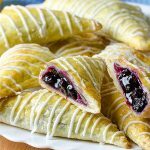 Divide the dough into two parts and roll each portion out to ¼ inch thickness. I don’t know why, but this is always my favorite part! Take one part of the dough and cut into heart shapes using a cookie cutter, transfer the cookies to the prepared baking sheet then using a smaller heart shaped cookie cutter and cut smaller hearts into centers of half of the hearts. Remove the smaller hearts and re-roll the remaining dough, continue cutting until all dough is used. Bake for 6 to 8 minutes. Let cool on the cookie sheet until firm enough to transfer to a cooling rack. 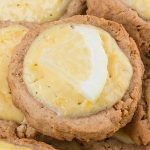 Mix together cream cheese and butter until fully combined, slowly add powdered sugar until fully combined. Spread cream cheese filling over whole hearts then place cookies with heart cut centers over tops. Sprinkle with Valentine’s sprinkle. Enjoy! 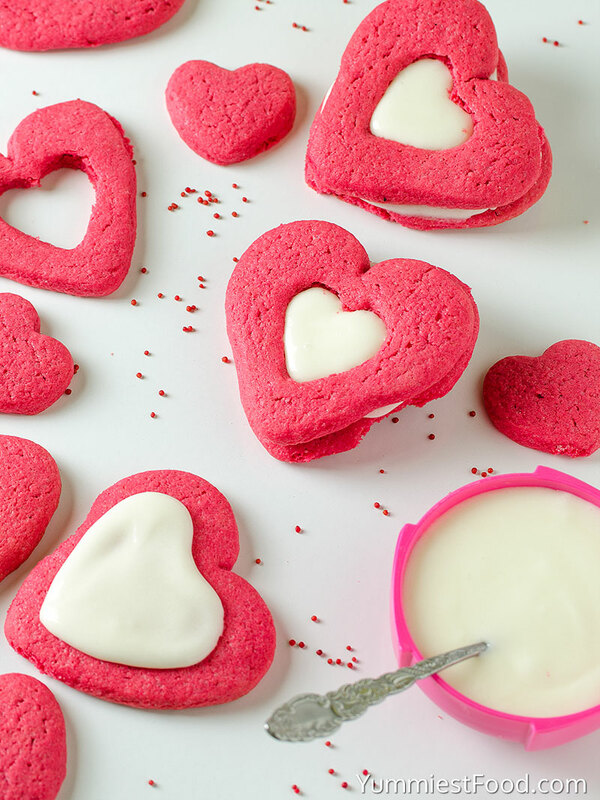 VALENTINES RED VELVET SANDWICH SUGAR COOKIES – Two red velvet sugar cookies are sandwich with cream cheese filling and topped with cute Valentines sprinkles! 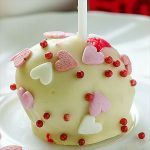 Easy and adorable Valentine's Day treat!